Earlier this year, it seemed that Los Angeles art/rap collective Odd Future had gone their separate ways, as Tyler, the Creator tweeted that the group were "no more," Earl Sweatshirt said that Tyler was simply "confirming the obvious," and the Internet's Matt Martians said that Odd Future had "shed that name." Now, rather surprisingly, it seems that the collective aren't finished after all, since they have booked a show. This appearance is part of Tyler's newly announced Camp Flog Gnaw Carnival in Los Angeles, which will take place at the Park at the L.A. Coliseum on November 14. Among the many names listed on the concert poster (above) is OFWGKTA, which is an abbreviation for the full name Odd Future Wolf Gang Kill Them All. It's not clear exactly which members will be a part of this Odd Future gig, but Pitchfork confirmed with reps that the group will indeed perform a full set. It's probably fair to assume that Tyler, the Internet and Taco will take part, since they all have their own sets at the festival. Of course, it remains to be seen whether this will represent a full-scale comeback for Odd Future or if this is just a one-off for Tyler's festival. 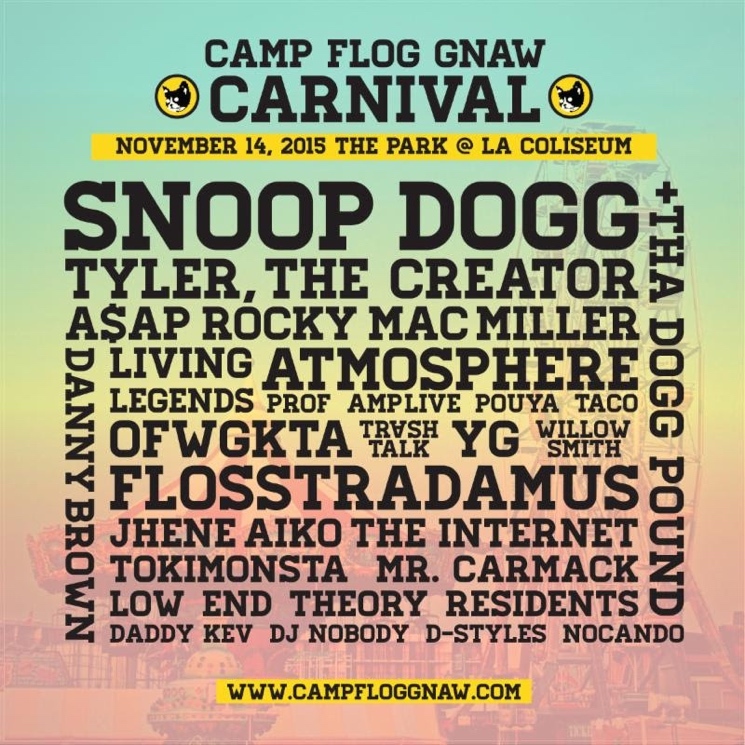 Other acts at Camp Flog Gnaw Carnival include Snoop Dogg, A$AP Rocky, Flosstradamus Atmosphere, Danny Brown, Mac Miller, YG, Jhene Aiko, Trash Talk, Willow Smith and more.